American Williams reached round three on Friday with victory over Sweden's Rebecca Peterson, only the seventh match she has completed in 2019. World number one Naomi Osaka suffered a shock three-set defeat at Taiwan's Hsieh Su-wei in their third-round tie. Williams said she was "disappointed to withdraw from the Miami Open due to a left knee injury". The 37-year-old has now withdrawn from two consecutive WTA events, following her retirement from last week's tournament in Indian Wells with a viral illness. 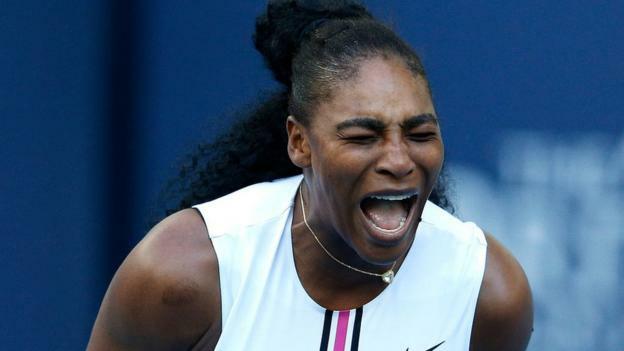 5, with her last Grand Slam win coming at the 2017 Australian Open, moving her one behind M argaret court's record of 24 Grand Slam singles titles. "I hope to be back next year to play at this one-of-a-kind tournament in front of the incredible fans here in Miami," she said. Japan's Osaka, 21, who has won the past two Grand Slam tournaments – the 2018 US Open and the Australian Open in January – lost 4-6 7-6 (9-7) 6-3 to 33-year-old world number 27 Hsieh on Saturday. "This was a very emotional win for me," said Hsieh, who will now face either Caroline Wozniacki or Monica Niculescu in the fourth round. "Any time you beat one of the top players it is amazing. " World number two Petra Kvitova was tested by Croatian Donna Vekic but won 6-4 3-6 6-4 to reach round four. She will now meet France's Caroline Garcia in the fourth round. Garcia beat 15th seed Julia Gorges of Germany 6-0 7-5.